This week's podcast interviews photographer Dave Black about his sports and light painting work. Then, get an overview of what's going on with Lightroom from product manager Sharad Mangalick. We welcome back Dave Black to the show for an interview with Vanelli. Dave is a freelance photographer for over 30 years. His work has primarily centered on the sports industry for such publications as Sports Illustrated, Time, Newsweek and the award-winning TV show Sports Century on ESPN. He's covered events like the Masters, Kentucky Derby, National Football League, NASCAR and extensive work regarding the United States Olympic Committee, Olympic athletes and coverage of twelve Olympic Games. What are some of Dave's latest work? Why it’s important to dream? Melissa Niu catches up with Sharad Mangalick, product manager for Adobe Photoshop Lightroom and Camera Raw. Find out about Lightroom Mobile and other things in the works. What does Sharad do with Lightroom? What kind of photographer is Sharad? What is exciting about where Lightroom is right now? Where can you find Sharad? This week's podcast catches up with two industry greats who both have exiting new projects. Melissa Niu digs deep with portrait photographer Brian Smith. Then Rich Harrington catches up with the original Photoshop guru Bert Monroy. Pulitzer Prize-winning photographer, Brian Smith, considers himself to be one of the luckiest guy on the planet. He’s told Bill Gates exactly what to do for an entire hour, appeared on The X Factor, exhibited at the Library of Congress, dined with the President, written an Amazon Best Seller, shared cupcakes with Anne Hathaway, gotten drunk with George Clooney and married the most beautiful woman he ever laid eyes on. His first magazine photograph appeared in LIFE Magazine when Smith was a 20-year-old student at the University of Missouri. Five years later, Smith won the Pulitzer Prize for Spot News Photography for his photographs of the Los Angeles Olympic Games. He was again a finalist for the Pulitzer for his photographs of Haiti in Turmoil. His photograph of Greg Louganis hitting his head on the diving board at the Seoul Olympics won first place in both World Press Photo and the Pictures of the Year competition. What is Brian up to? What is he shooting on? What else is Brian working on and teaching? Bert Monroy is considered one of the preeminent pioneers of digital art. He builds his hyper-realistic digital paintings as a traditional artist would, adding color and texture, except he uses Adobe Photoshop and Illustrator as his media. Bert co-authored the first book on Photoshop. His film credits include work for Industrial Light & Magic, Pacific Data Images, and R/GA. Bert has taught the Adobe Photoshop Creativity Seminar Tour, and he is a popular speaker at many conferences worldwide. He is a member of the Photoshop World Dream Team and was inducted into the Photoshop Hall of Fame in 2004. How does shadows and highlights play a role in his work? What classes on lynda.com is coming out? This week's show is a triple header. First, Pamela Berry sits down with photographer Michael Bonocore to discuss the importance of capturing moments and inspiration. Then Rich Harrington talks with Lindsay Adler on personal projects and self-assignments. Finally Levi Sim and Rich Harrington talk with Matt Thompson from SongFreedom about music for photo and video projects. Michael has been a fixture in the photography industry for over 7 years. His photography journey started as a hobby, primarily learning his way around a DSLR by shooting landscapes around his home in San Francisco, California. Soon, he started accepting paid assignments, from commercial ad campaigns to weddings, but his passion for traveling with camera in hand was too great to ignore. Michael started visiting locations all over the globe, documenting not only the beautiful landscapes of the countries he visited, but also the lives of the local communities. Michael began working with international non profit organizations to help bring awareness to the causes that he was passionate about. Through the workshops that he leads for The Giving Lens, he has taught children the art of photography in countries such as Nicaragua, Peru, Jordan and India. He has documented the work of elephant sanctuaries in Thailand and he has helped bring awareness to Women’s Cooperatives in the Middle East. What is he working on? What inspired the photography he does? Lindsay Adler is a professional portrait and fashion photographer based in New York City. Her editorial work has appeared in numerous fashion and photography publications internationally including Noise, Bullett Magazine, Essence, Zink Magazine, Rangefinder and dozens more. A clean, bold and graphic style has become the hallmark of her work, making her in-demand for clients across the world. Her portrait and commercial work includes look books, accessory lines, hair campaigns, cosmetic campaigns, professional athletes, television series promos and more. She is always working on new ways to share her passions and knowledge with others, and each year she lectures tens of thousands of photographers world-wide. She attributes a lot of her success to her parents NEVER suggesting that she ‘get a real job’ and encouraging her to pursue photography even in her pre-teens. What she is currently working on and why? Should you share personal projects? What are goals to achieve from a personal project? Do you expand the type of photography in a personal project? Her latest company for photographers? Nothing makes a slideshow or video better than a great soundtrack. But there are a lot of rules when it comes to using music. We demystify the process of using music in your project and offer some great techniques too. What does it mean to license music? This week's Is a double-header, packed with information and inspiration. We'll catch up with two very different photographers who will both inspire you with practical tips and challenges. Glyn Dewis is a Photographer and a Retoucher. He is also a Photoshop World Instructor based just outside of Oxford in the UK. He works internationally shooting promotional and commercial photos primarily focussed on Physique Athletes, Musicians, Bands and Up and Coming Actors. How do you make personal projects happen? Why are personal projects so important? Rich Harrington catches up with photographer Robert Vanelli (aka V). After a successful career as a three time Triple Crown Karate champion, Robert Vanelli turned his attention to teaching. As an educator for over 30 years, Vanelli has created several photography and digital workflow programs including a special program, Click for Kids. Borrowing concepts from the martial arts, Vanelli instilled values such as integrity, and goal setting using photography as a vehicle to motivate children. What struggles do new photographers face? This week's podcast is a Double Double... We sit down with four great photographers two at a time. First, Levi Sim talks with Tamara Lackey and Peter Hurley. Then Melissa Niu talks with two of our Photofocus team members (and great photographers) Nicole S. Young and Brian Matiash. What hats we wear as photographers? Where you can find Tamara and Peter? Nicole is a full-time photographer and author. Her photography specialties are food and landscape, and sh also creates stock images for iStockphoto and Getty Images. She loves to teach, learn and share what she knows through her blog, articles, podcasts, interviews and training materials. Brian is a photographer and a published writer. He is a regular contributor to Photoshop User Magazine and Photoshop Elements Techniques, as well as a new member of the Photofocus team. He's spoken at the Google+ Photographers Conference and Photoshop World. He admits to having a " [not-so] tiny obsessions with long-exposure photography, neutral density filters and tilt shift lenses. " What is happening next in the industry? Why do you think every single camera has default setting jpeg? What is the destiny of a typical photo? This week's podcast is a whopper... packed with information and inspiration. We have the world's most popular photo instructor, Scott Kelby to share tips and news. Then Rich Harrington and Chase Reynolds explore new gear from Nikon and Sony. Lastly Levi Sim sits down with portrait photographer and Photofocus writer Kevin Ames. Scott Kelby is the President and CEO of KelbyOne, is also the original “Photoshop Guy”, is the Cofounder and CEO of Kelby Media Group, the editor and publisher of Photoshop User Magazine and Light It Magazine, Conference Technical Chair for the Photoshop World Conference & Expo, Training Director and instructor for KelbyOne Live Seminars, and author of a string of bestselling technology books. What kind of classes are at Photoshop World? What’s new at Photoshop World this year? What makes a good portfolio review? Rich Harrington and Chase Reynolds of LensRentals.com to talk about some of the hottest new pieces of gear to hit the shelfs. Once a month we'll explore some of the most popular pieces of equipment. Be sure to leave questions for future shows in the comments. Perks of using lens rentals (Save 15% with Summer15 or 10% with FOCUS10). What kind of cameras are people actually using? Kevin Ames is a photographer who started shooting commercial photography while attending Boise State University and working full time at Idaho Camera. His career continued as part of the first generation of videographers working for the NBC and CBS affiliated television stations in Boise. He has also written, produced, photographed and directed television commercials. This week's podcast interviews with two folks influencing the world of photography. First up is well-known portrait photographer Brian Smith who walks us through his workflow of posing subjects and working with mirror-less cameras. Then find out about long exposure, night sky and timelapse photography. How Brian got his start? Be sure to catch up with Brian at this year's Photoshop World. Ron is an award winning cinematographer, editor of Cameratown.com, and timelapse specialist and instructor located on the seacoast of New Hampshire. Ron has been a photographer & videographer for over 25 years and continues to follow his passion when it comes to capturing and teaching night photography. Ron has been commissioned to shoot time-lapses for corporations such as Liberty Mutual and Restoration Hardware; news organizations such as FOX CT News and WFTV-9 Orlando, and his timelapse work recently appeared in an HBO Film "The Crash Reel" which premiered last year at the Sundance Film Festival in Park City, Utah. What type of imagery does Ron create? What does he like about night photography? How does nighttime photography change when shooting close to a city? Is there a renewed interest in long exposure photography? Why he was a terrible film photographer? This week's podcast interviews photographer Matt Kloskowski from Kelby One. Rich and Melissa also check in with Chase Reynolds about two hot pieces of gear and prime lenses. Rich Harrington and Melissa Niu catch up with LensRentals.com to talk about some of the hottest new pieces of gear to hit the shelfs. Once a month we'll explore some of the most popular pieces of gear. Be sure to leave questions for future shows in the comments. How is lensrentals doing right now? Shooting same locations over and over again? Why be excited about this lens? What are some go to primes? Where to start with Primes? What is lensrental.com all about? Matt Kloskowski is a full-time Education Director for Kelby Media Group and a Tampa-based photographer. He's the Editor of Lightroom Magazine and teaches Photoshop and Lightroom seminars around the world. What he does for Kelby one? How teaching and learning photography is better these days? What kind of photographer is Matt? Does he like going back to shoot the same places? Is it ok to that? This week's podcast interviews with two folks influencing the world of photography. First up is Colin Smith who discusses his journey with Photoshop as well as photo realism and lighting. Then Rich Harrington and Gerard Murphy sit down to talk about the evolving mobile workflows. Colin Smith is a best-selling author, trainer, and award-winning digital artist who has caused a stir in the community with his stunning Photoshop work. Colin is also known as a pioneer of HDR photography. Colin is an Adobe ACP (Adobe Community Professional), He is founder of the world’s most popular Photoshop resource site, PhotoshopCAFE.com, which boasts over 30 million visitors. Tips on observing and seeing color. Be sure to catch up with Colin at this year's Photoshop World. What happened to Apple Aperture? What you can use Mosaic app on? This week's podcast interviews with two folks influencing the world of photography. First up is Adobe's Sharad Mangalick who discusses how to use Lightroom Mobile. Then Melissa Niu sits down artist & photographer Renee Robyn. Levi Sim catches up with Sharad Mangalick, product manager for Adobe Photoshop Lightroom and Camera Raw. Find out about Lightroom Mobile and other things in the works. Be sure to catch up with Sharad at this year's Photoshop World. How would Renee describe her work? How Renee creates her images? How Renee views her images? What is essential on her sets? What was a life changing experience for Renee? Where can people find Renee? This week's podcast interviews three folks influencing the world of photography. First up is Adobe's Bryan O’Neil Hughes who discusses his view's on where photography is heading. Then Rich Harrington and Levi Sim talk about storytelling and photography. Finally, Melissa Niu sits down with top wedding photographer Jonas Peterson. Bryan O’Neil Hughes is the Senior Product Manager for Adobe Photoshop software and a pinch hitter for the Photoshop Lightroom software team. Since 1999 he has helped to test, drive, demonstrate, and lead development of Adobe’s professional digital imaging applications. Bryan is the Photoshop team’s primary worldwide spokesman and can often be found leading seminars, user groups, and workshops. Be sure to catch up with Bryan at this year's Photoshop World. What cameras does he use? What is upcoming with Mosaic? Jonas left a highly awarded career as a writer in advertising to become a wedding photographer. More than one eyebrow was raised, but he had an idea that stories through wedding photography could be told differently. Should be told differently. Today he’s one of the most sought after destination wedding photographers around, shooting weddings all around the world. He has shot weddings in almost all parts of the world, using his unique storytelling through simple – yet beautiful – imagery. His home is Melbourne, Australia, but he’s on the road around the world for half of the year, so never assume he won’t be able to shoot your wedding, no matter where it is. How he became a photographer? What kind of photographer is Jonas? How has his past affected his photography? What advice does he have for photographers trying to do what he does? Where can you find Jonas? This week's podcast interviews photographer Lindsay Adler who talks about her new studio and getting started in the world of fashion photography. Rich also gives you a quick update on the new photo options from Apple for Mac, Windows, and iOS We then check in with Chase Reynolds about two hot new pieces of gear. Example face on how to light. What classes at Photoshop World will Lindsay be teaching? Where can we find Lindsay? Rich Harrington and Melissa Niu catch up with Chase Reynolds to talk about some of the hottest new pieces of gear to hit the shelfs at LensRentals.com. Once a month we'll explore some of the most popular pieces of gear. Be sure to leave questions for future shows in the comments. How to use a gimbal? LensRentals.com Be a kid in a camera store. Rent lenses, cameras, lighting and more from the original and best online photographic and video equipment rental company. Use PHOTOFOCUS15 in the checkout special instructions to receive 15% off any May rental. Mosaic A complete solution for photographers using Lightroom who want to manage and share their photos. You can easily view images with their iOS app or web service. Plus your photos are backed up to the cloud with several plans to match your needs. Be sure to also check out the Lightroom Learning Center to learn new ways to work in Lightroom. Photoshop World, the ultimate Photoshop, Photography & Lighting Conference. Las Vegas, NV, September 3-5. Use the promo code PSWFOCUS414 to discount $50 OFF a full conference pass. Learn more in three days than you have in three years! ViewBug Stick With ViewBug & Photofocus throughout 2014 – because we’ve announced the biggest contest in Photofocus history! This week's podcast interviews photographers Dixie Dixon and Doug Hansgate. The show offers practical advice and inspiration from two photographers at different points in their careers. Don't forget to post a review on iTunes. Dixie Dixon is a Texas born and bred commercial fashion photographer. Just a few years out of college, this 20-something’s career is unfolding one adventure after another. She was given her first Nikon Camera, the Nikon FG, at just 12 years old, which peaked her curiosity in the field and served as her sidekick in exploring the world. She would continually clock seven to ten hours in the darkroom without even realizing it. While in college she studied in London with a world-renowned fashion photographer and became deeply inspired by the beautiful illusion of fashion and commercial photography. It has been said that her idealistic vision of the world is reflected into every single frame- full of life, beautiful energy, and most of all, Soul. Her passion has lead her to shoot internationally in places such as Cannes, Toronto, Vancouver, New York, Miami, Los Angeles, Ibiza, and Barcelona recently for various brands, tv shows, commercial campaigns and editorial projects. Advice to starting out in the commercial industry. Doug Hansgate has been shooting professionally for over 35 years. His work has been on display in galleries in New York City and Toronto. The photography bug bit Doug at a young age when his father gave him a Voigtlander camera. By the time he was 16, Doug was the high school yearbook photography editor and had built a darkroom in his parents’ home, where he processed black and white images. Where can we find Doug. This week's podcast interviews photographer Dave Black about his sports and light painting work. Then, get an overview of what challenges photographers will face over the coming years with photography guru Jim Heid. We welcome back Dave Black to the show for an interview with Levi Sim. Dave is a freelance photographer for over 30 years. His work has primarily centered on the sports industry for such publications as Sports Illustrated, Time, Newsweek and the award-winning TV show Sports Century on ESPN. He's covered events like the Masters, Kentucky Derby, National Football League, NASCAR and extensive work regarding the United States Olympic Committee, Olympic athletes and coverage of twelve Olympic Games. What kind of photography does Dave make? Remember you can take classes with Dave Black at Photoshop World in Las Vegas this September. Jim Heid has been taking photos, making movies, and playing music since he was a kid. He began writing about personal computers in 1980, when he computerized his home-built ham radio station with a Radio Shack TRS-80 Model I. 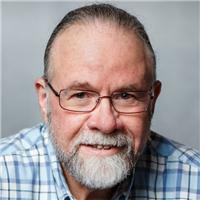 He has also written for Macworld, PC World, Internet World, and Newsweek magazines, and a nationally syndicated technology column for the Los Angeles Times. Jim Heid is one of the most admired writers and instructors and now oversees the photography segment for lynda.com. He helps guide which courses get developed and make sure that he keeps track of what's needed to help photographers get the most from their art and gear. Why Jim pretends he shoots on film? Why limitations can be catalysts to creativity? This week's podcast interviews popular photographer Zack Arias who discusses big changes in his work and professional life. We then check in with Chase Reynolds about two hot new pieces of gear. When that's done, find out about our latest contest with big prizes. What new gear excites Zack? What Zack is shooting these days. Why should you house clean your photography? "When God said let there be light, Joe McNally handed him a flash"
Melissa sits down with Orri from ViewBug to talk about the new Photofocus contest which just kicked off. Learn about some of the fantastic prizes as well as how to enter. This week's podcast features a triple dose of photo knowledge. First up, Melissa Niu catches up with portrait photographer Tamara Lackey. The Rich Harrington and Ron Pepper discuss panoramic photography workflows. Then we jump back to Melissa as she interviews Jerry Ghionis for his take on shooting portraits and where the photo industry is headed. Why should you go to photography conferences? Ron Pepper is the primary of PanoramaNETWORK. We explore his work with panoramic photography and architectural photography. PanoramaNETWORK was founded in 2003 in Madrid, Spain. His photography consists of modern, 360 degree by 180 degree panoramic photography showing any location in a realistic immersive way, from ceiling to floor!. What brought Ron into Panoramic Photography? What 360 photography is being used for? What skills can Landscape and Interior photographers learn to make more panoramic images? Where to learn more about Ron, HDR, & panoramic photography? As one of the few modern masters of wedding photography not proficient in Photoshop, Jerry Ghionis has learned to create stunning images in camera. Known as the “MacGyver” of photography, Jerry has the innate ability to turn ordinary situations into extraordinary images using any light source and ordinary objects around him. A United States Nikon Ambassador, Jerry was named in the first ever list of Top Ten Wedding Photographers in the World by American Photo magazine. In 2011 Jerry was named by PDN magazine as one of the top photography workshop instructors in the world. Where is the wedding industry headed? Where to find Jerry online? This week's podcast features two photographer's who are well-respected in their field. First up Rich Harrington catches up with landscape and aviation photographer Moose Peterson. Then Melissa Niu interviews Canon Explorer of Light, Eddie Tapp. Moose’s true passion is wildlife photography and he considers himself incredibly fortunate to be amongst North Americas critters and bring back their story with his camera. Along the way Moose has been fortunate to be recognized for his passion. One of the original Nikon shooters to receive the D1 in 1999, Moose embraced this new technology becoming the only wildlife photographer in the world to shoot strictly digital in the early years. While a beta site for all the major hardware and software manufacturers, Moose continues his main goal of photographing the life history of North America’s endangered wildlife and wildplaces. Being a creative innovator of new techniques both behind the camera and the computer is the driving force behind his photography and goals. What led Moose to his photography interests? A gifted photographer and artist, Eddie Tapp has become a tireless educator for professional photographers and a prominent figure in the world of digital imaging. His digital imaging seminars have been hosted around the world, and he’s a regular consultant to businesses large and small. Today, he’s recognized as one of the top experts on digital photography and Photoshop in the world. With a reputation as an authority on workflow, color management, calibration and Photoshop, he is associated with Adobe Systems along with some of the world’s most prominent photographic manufacturers and distributors. What is Eddie up to right now? What is it that Eddie LOVES about photography? What does Creative Cloud mean to Eddie? Where can you find Eddie? This week's podcast features three great folks from the photo industry. First up Rich Harrington catches up with one of the best image makers on the planet, Joe McNally. Melissa Niu then catches up with photographer and Adobe expert Terry White. You'll then learn all about ViewBug, a great site for entering photo contests and winning prizes. What he's been up to with small flashes. Why you should sometimes "think within the box"
Terry White – Worldwide Design Evangelist for Adobe Systems, Inc. In his job, he leads the charge of getting customers excited and educated about Adobe Creative Cloud products and services. Terry is an Adobe Certified Expert. He has been active in the industry for over 25 years and is the founder and president of MacGroup-Detroit. From time to time we tell you about some of our great partners. Since we're getting ready to launch our biggest photo contest ever, we decided to bring you up to speed on ViewBug. Learn all about this cool photo community and photo contest site. What are Ori’s favorite styles of photography? This week's podcast features two diverse subjects who both have interesting perspectives on the photo industry. First up Rich Harrington catches up with portrait photographer Peter Hurley who's well-known for his approach to head shots. Melissa Niu then speaks with Ed Greenberg about the rights of photographers. It turns out that both our guests will be speaking at Photoshop World in April. Be sure to catch them both (and save on registration with the code PSWFOCUS414). What's the key to his work? What Peter does when he meets a new client? Why the jaw matters when taking a portrait or headshot. What you can learn from Peter at Photoshop World. How to direct your subjects. Ed Greenberg has been a litigator practicing in New York City for over thirty years. He's represented some of the top photographers and illustrators in the business as well as the average Joes and Janes striving to make a name for themselves. He has been on the faculty and a guest lecturer in the Masters Program in Digital Photography at The School of Visual Arts in New York and has lectured nationwide on photographers’, artists’ and models’ rights. How can a photographer avoid giving their work away for free? Why you shouldn't take legal advice from someone who is not an attorney. What can photographers just starting out do? This week's podcast features tips on how to organize and manipulate your images. First up, Rich Harrington and Peter Krogh explore backup and organization workflows for all users. Then Melissa Niu catches up with Wes Maggio from Wacom. Peter Krogh is a photographer, writer, filmmaker, publisher and consultant. In the last decade, Peter has become one of the world’s foremost authorities on Digital Asset Management and workflow. He has worked with companies that create the digital photography ecosystem, such as Adobe, Microsoft, iView, Phase One, CRU, O’Reilly Media and PhotoShelter. How did Peter balance creativity and organization? Once you have all your files, what’s next? What is Peter’s 3-2-1 Rule? Should you keep everything you shoot? Weston (Wes) Maggio is a Senior Solutions Manager and Evangelist for Wacom. Wes regularly consults with creative professionals and enthusiasts, helping them learn new ways to control their software. Wes is also an avid photographer. Het enjoys shooting adventure sports and landscapes. Who is Wes and what does he do? How can having tablet benefit a photographer? Ending advice about having a tablet and just starting out. Where can we find Wes Maggio’s work? This week's podcast features a popular guest who's returned to visit us and a photo industry influencer who's usually invisible behind the scenes. First up Melissa Niu speaks with Tamara. Then Rich Harrington speaks with Dave Moser and his work with Photoshop World. Tamara Lackey who is a professional photographer, speaker, and author. She focusses on lifestyle photography, from children’s portraits to celebrity portraits. Tamara’s work has been featured in dozens of media outlets, including Parenting Magazine, O – The Oprah Magazine, Town & Country, Vogue, Food & Wine, Men’s Journal, Nikon World, Professional Photographer Magazine, Rangefinder Magazine, Photoshop User Magazine, NBC’s The Martha Stewart Show, ABC’s Extreme Makeover: Home Edition, PBS’ Need to Know and NBC’s The Today Show. Where to find Tamara online? Dave Moser is the Executive Vice President of Kelby One. While they may sound a little stiff, Dave is fully plugged in to the world of creative professionals. He started as one of the original publishers in the Mac community with MacCentral. Dave is involved in putting together great events like Photoshop World. Rich and Dave talked before the name change from Kelby Training to Kelby One. Be sure to listen to this week's podcast. We catch up with two photo gurus. First up Melissa Niu speaks with Frank Doorhof. Then Rich Harrington speaks with Gerard Murphy about the evolution of Lightroom and mobile libraries. Amsterdam based photographer Frank Doorhof is well-known for his approach to lighting. His primary subjects include artists and high fashion. Frank also spends a lot of time leading workshops and sharing his wisdom through his blog. How did Frank get into photography? Why he uses both Dutch and English to reach the world. The importance of knowing your audience. How he uses film and digital to get the job done. Why are so many people wanting constant access to photos? Gerard's theory on why photography is 10 years behind music technology. What's going on with camera manufacturers? Why is the iPhone so successful? How to protect your RAWs & back them up. General trends with mobile devices and photography. This week's show features interviews with two photo gurus. Melissa Niu catches up with photographer Bill Fortney about his approach to shooting and life. Then Rich Harrington talks with Bruce Dorn about his photography and cinematography. Who is Bill and what is his background? What changed for Bill so personally that affected the path his photography career to this day? What is his simple truth to him in his life drives how he treats others and teaches others? What is happening with technology and how does he foresee the future of photography? Where can you find Bill online? Bruce Dorn has been a full-time professional image-maker since 1973. He began his career working for Conde Nast – the publishers of Architectural Digest, Glamour, Vogue, Women’s Wear Daily, and Vanity Fair magazines. He eventually added television commercials to his resume and was inducted into the Directors Guild of America in 1984. What excites him right now in the media industry? Where to find Bruce online? His latest project that's taking him around the world. This week's show features three interviews with three experts in the photo industry. Melissa Niu catches up with photographer and retoucher Glyn Dewis. Then Rich Harrington welcomes back Ron Pepper to talk about changes to HDRSoft's Photomatix. Finally Kevin Stohlmeyer discusses strategies to learn new tools and techniques for post-processing and publishing. Where should you start with post-processing? How Zack Aries changed the path of his photography? How does Glyn "label" himself? Where can you find Glyn's work? Ron Pepper is the primary of Panorama Network. We explore his work with HDR, panoramic photography, and architectural photography. He also works as a consultant to HDRSoft and Photomatix. We get a detailed update of what's new in the software and some hidden gems. Even if you don't use HDR, you'll get new ideas on how to tackle tough exposures. How is the new release of Photomatix being received? What techniques are best suited to Architecture photography? Why can everyone benefit from an HDR approach? Why you need a 64-bit operating system to get the most done on your computer. How to preview your results in less time. How to post-process multiple for large jobs. Where to explore more with HDR? Kevin Stohlmeyer is a designer who frequently helps teach photographers how to take advantage of digital publishing tools. He's based in Milwaukee, Wisconsin but works with students around the world. He works with professionals and universities to help them embrace new digital publishing technologies. He is also a regular writer for Photoshop User and Adobe Inspire Magazines. How being knowledgable in more then one aspect of design is normal nowadays. What are some new things with Creative Cloud that stands out?